Comtrol is helping to spread the industrial IO-Link initiative… who else is using IO-Link? Copyright © 2014 Comtrol Corporation, All rights reserved. Comtrol is introducing the DeviceMaster UP 16 Modbus compact Modbus gateway designed to provide serial and network communication between a vast array of Modbus controllers and devices. Simplified configuration pages, comprehensive connectivity options, and informative diagnostics make for quick and easy set-up of even the most complex Modbus installations. For most organizations employing sophisticated automation systems for manufacturing, distribution, and warehousing have historically been hampered by technical and feasibility issues connecting plant floor devices to PLCs within the enterprise due to incompatibility with industrial automation control systems. This communication problem is solved with the DeviceMaster UP. 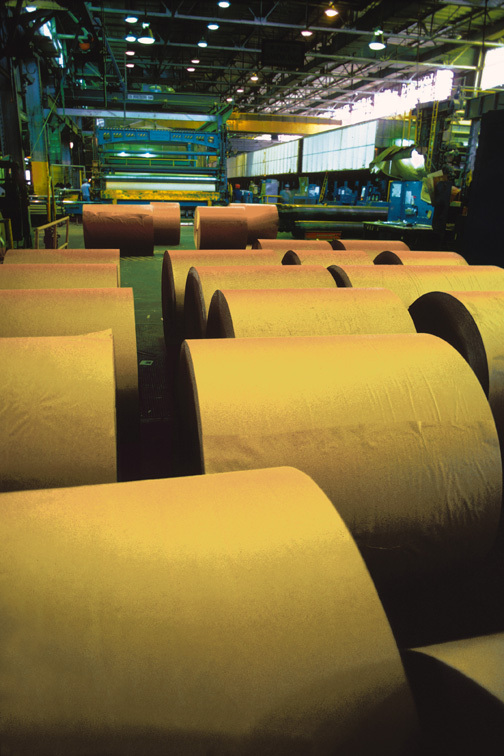 When Smart Papers, a leading commercial paper manufacturer, set the goal to improve finished product quality assurance and gain more detailed manufacturing lot information using existing infrastructure, they chose the DeviceMaster UP. It worked perfectly with their EtherNet/IP network, which extended commercial off-the-shelf Ethernet to the Common Industrial Protocol (CIP™), and upper layer protocol fully compatible with standard TCP/IP protocols such as HTTP and SNMP. CIP allows EtherNet/IP product developers, system integrators and users to apply the same objects and profiles for plug-and-play interoperability among devices from multiple vendors and in multiple sub-nets. EtherNet/IP provides manufacturers with a proven and future-proof Ethernet network solution, one that incorporates all the advantages that have made Ethernet and internet technologies ubiquitous and essential in office applications, while delivering interoperable, open network products that are supported by a vast network of vendors worldwide. Security and visibility are becoming increasingly important in today’s Modbus installations. Engineers are being asked to provide more visibility to Modbus installations, and at the same time, are also being asked to keep devices secure from unauthorized access and errant configuration changes. To make things more challenging, they are also being asked to do more with existing equipment. And let’s not forget the all-too-common limited budgets and tight schedules. So, how does one add a SCADA or HMI system to an existing Modbus network without compromising the security of existing Modbus devices? How does one design a Modbus installation that limits control of Modbus slave devices to a single Modbus master and yet can provide status information from those same device(s)? How does one add additional equipment quickly, easily and economically? And how does one maintain such an installation once it is operational? That is not easy – unless if you have a DeviceMaster UP running Modbus Router. At Comtrol, we are constantly looking for innovative ways to help solve such challenges. Unique and extensive functionally designed to solve the most difficult problems with ease-of-use, robustness, and maintainability – that is what we are all about. 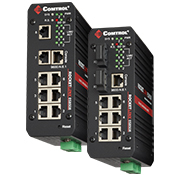 MINNEAPOLIS, Minnesota — November 21, 2013 — Comtrol Corporation, a leading manufacturer of industrial device connectivity products, today announced the release of the RocketLinx® ES8508-XT series of industrial managed Ethernet switches. The introduction of this new 8-port switch series extends Comtrol’s popular RocketLinx line of industrial Ethernet switches by providing the convenience of both copper and integrated fiber Ethernet ports in a compact, extended temperature range switch ideally suited for deployment in factory, traffic and railway applications. Like all RocketLinx switches, the ES8508-XT series meets the performance and environmental criteria for demanding applications with an extended operating temperature, rugged design, and broad security and performance features including VLAN, QoS, and RSTP/MSTP support. 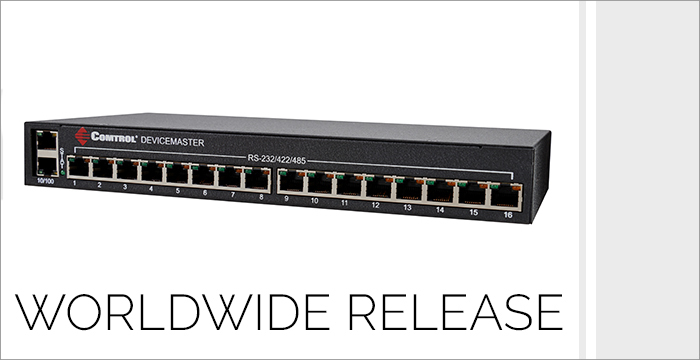 The new RocketLinx ES8508-XT model includes eight (8) 10/100BASE-TX ports while the ES8508F-XT models (Single-Mode and Multi-Mode) feature six (6) 10/100BASE-TX and two 10/100BASE-FX SC fiber ports. All three switches meet EN50121-4 EMC and IEC 61373 vibration standards for railway applications. 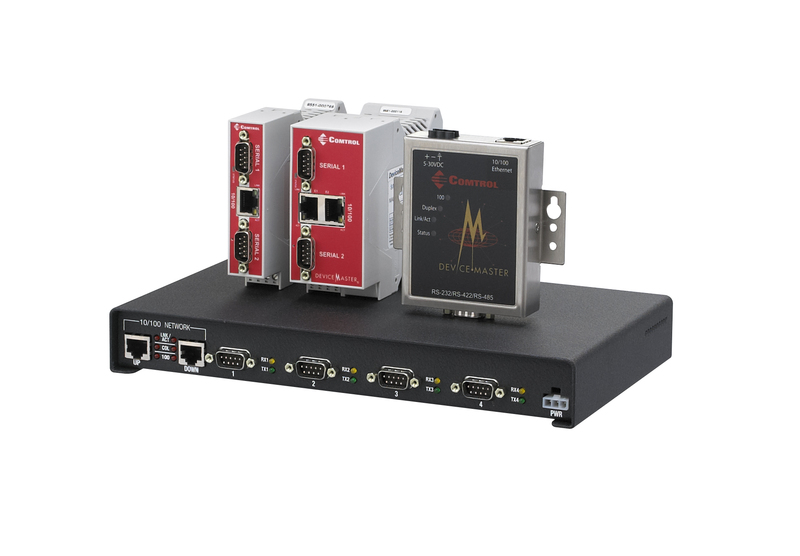 The ES8508-XT series also supports Modbus TCP/IP for integration with factory networks and includes the latest technologies to ensure reliable, high-bandwidth data communication including a 32Gbps switch fabric for real-time non-blocking data transmission, dual 10-60VDC redundant power inputs (positive or negative), redundant network topology support, and a high performance ARM9 processor with an embedded hardware watchdog timer for system reset and recovery. Today’s Modbus installations are becoming increasingly complex. More and more installations are requiring the use of multiple Modbus controllers, and the need to share information between the controllers is becoming increasingly important. Sharing information between Modbus controllers can be relatively easy if one controller can communicate as a master (or client) and the other as a slave (or server). The master controller simply sends a message to the slave controller and the slave responds. However, what do you do when each controller can only be configured as a master? The DeviceMaster UP, running with the Modbus Router firmware, provides master-to-master connectivity using a configurable Shared Memory sub-system. The Shared Memory sub-system features eight Holding Register blocks containing 200 registers each, and eight coil blocks containing 160 coils each. Write access for each Shared Memory block can be either enabled for all masters or restricted to a single master. Write messages that are addressed to restricted block(s) from unauthorized master(s) are rejected, logged, and displayed in the Write Violation Log web page. Additional web pages provide configuration, diagnostics, and status information for the Shared Memory blocks. A major American brewing company was in need of a solution for its production facilities that could network multiple production processes together and be able to withstand temperatures in excess of 140°F without failing. Multiple controllers and production machines needed to be seamlessly connected, and it had to work flawlessly. After extensive research and testing, the company chose to deploy Comtrol’s DeviceMaster® UP. Loaded with Modbus/TCP firmware, the DeviceMaster UP provides the brewery a flexible, easy-to-use and highly robust solution. 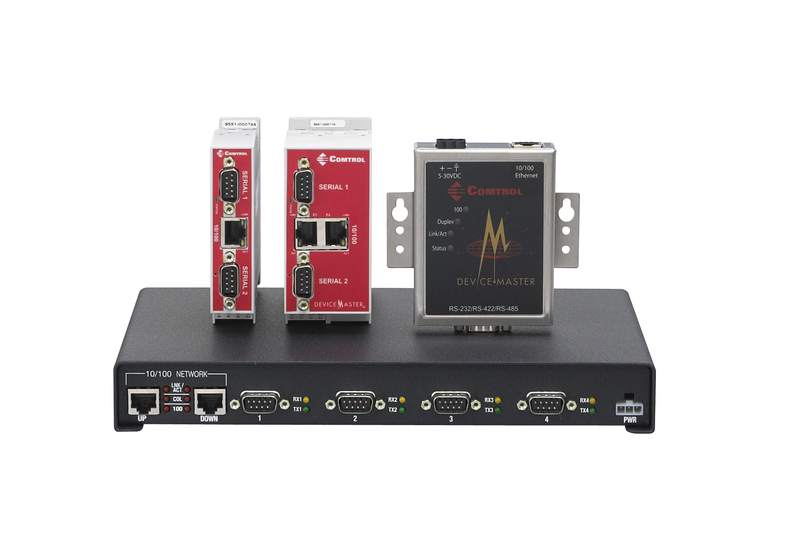 Controllers include SCADA systems communicating over Modbus/TCP and PLCs communicating via Modbus/TCP, serial Modbus/RTU or serial Modbus/ACSII. The production machines communicate via ASCII data, Modbus/RTU or Modbus/ASCII. Further complicating the situation, the ASCII data machines need to communicate to each controller independently. 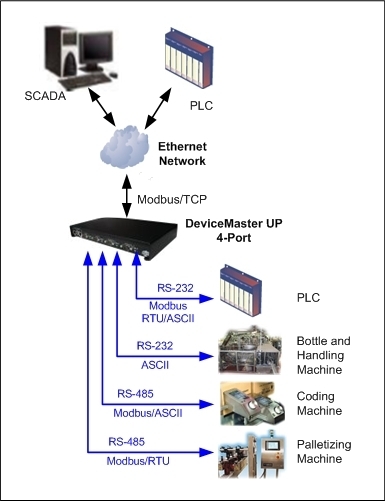 The DeviceMaster UP seamlessly networks the controllers to the production machines. The automatic Modbus protocol conversion functionality enables multiple Modbus controllers to communicate to the serial Modbus machines. The industry’s first command/response mode enables multiple controllers to independently communicate to the ASCII production machines. In case you missed it, we recently published a post explaining IO-Link technology along with an overview of our IO-Link Master EIP-4 product. As more people learn about the benefits of IO-Link, the more questions we get about our master’s features. Here are some of the features explained below. 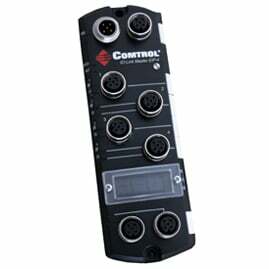 One of the features explained is how Comtrol’s IO-Link Master EIP-4 eliminates complex and lengthy PLC programming for process data and ISDU handling (sometimes known as SPDU). The DeviceMaster UP industrial Ethernet gateways are designed to provide EtherNet/IP, Modbus/TCP, Modbus RTU/ASCII, and PROFINET PLC connectivity to a wide variety of devices. Unique protocol-specific features – Peer-to-Peer Modbus/TCP, Write-to-Tag EtherNet/IP, etc. An energy meter manufacturing company based in Cairo, Egypt discovered that there is an economical solution to the extra time and cost that can be accrued by sending out company personnel to manually read electrical meters and log energy usage from each floor of a commercial building. Property management and energy companies can reduce time and expenses by adding a DeviceMaster® Ethernet gateway to their physical system configurations as well as a corresponding software program on their networks. Comtrol’s DeviceMaster UP 1-Port has been used by the energy meter manufacturing company to complement its meters and provide as a package to property management companies. 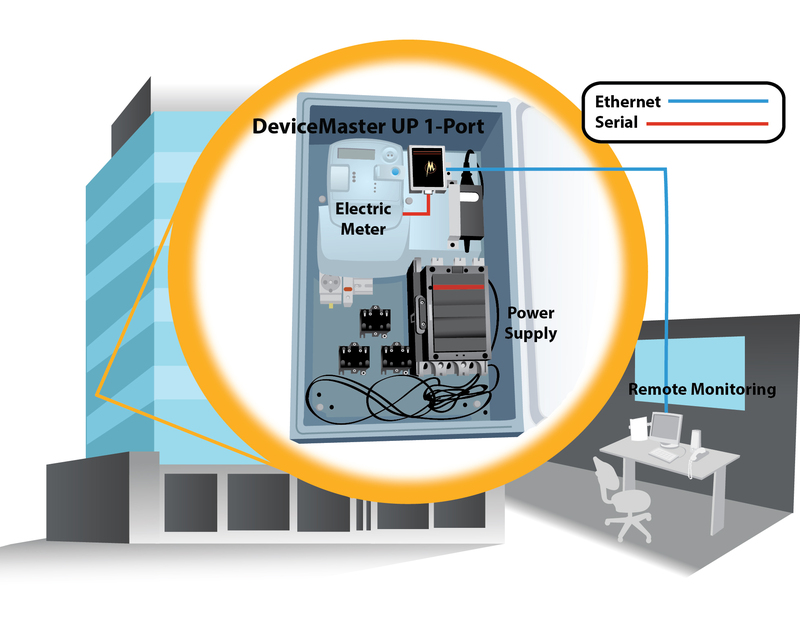 The DeviceMaster UP 1-Port has the capability to connect the energy meters together for remote reading and monitoring.